A solar wind stream flowing from the indicated coronal hole could reach Earth on August 25th. Image credit: SOHO Extreme UV Telescope. Venus and Jupiter are converging in the western sky. Would you like a call when they meet? Sign up for SpaceWeather PHONE. BEWARE THE MARS HOAX: Believe it or not: On August 27th, Mars will be so close to Earth that it's going to look as big as the full Moon. Not! Contrary to rumor, Mars will look absolutely normal next Saturday. Science@NASA has the full story. SUNSPOT SURPRISE: Sunspot 798 reminds us why astronauts can never breath easy outside the safety of their habitat or spaceship: The sun can change from quiet to active in a surprisingly short time. On August 18th, sunspot 798 didn't exist. Then, in less than 24 hours, it materialized and grew into a planet-sized behemoth. Fast-growing sunspot 798, Aug. 18th - 21st. Credit: SOHO. When sunspots develop at breakneck speed, their magnetic fields can become unstable and explode. Sunspot 798 now poses a threat for M-class solar flares. 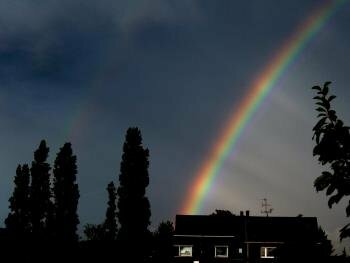 Atmospheric optics expert Les Cowley explains: "The next time you see a rainbow, look inside it. The sky is brighter there because raindrops deflect sunlight towards the inside of the bow as well as forming its colors. When a small cloud shadows some of the drops they can no longer form part of the bow or light the inside. The result is a shadowy 'spoke.' The spokes converge on the antisolar point, the rainbow's center, to produce a wagon wheel in the sky." You are visitor number 33403681 since January 2000.